A ban on non-EU unskilled workers may have to be lifted if preparations for the 2012 Olympics are running late, a committee of peers has been told. Such workers are currently facing a ban for the "foreseeable future". But Professor David Metcalf - head of the new Migration Advisory Council (MAC) - suggested that might have to change if there were labour shortages. UK firms might not be able to train enough native workers in time for 2012, he told the Lords economic committee. The MAC is drawing up a list of official shortage occupations which British firms will be able to advertise outside the EU. These are likely to include a small number of jobs on the 2012 Olympics such as site supervisor. But Professor Metcalfe said there could be a shortage of unskilled labour too, particularly with demands from other big projects in south-east England, such as Crossrail. "One would certainly want to see whether or not it could be sensibly filled by British employers. "The worry I think one has about this, is the inevitable tension between the short run and the long run. "If you talk about the Olympics having to be on-stream by 2012 and therefore the facilities having to be built by 2011, a modern apprenticeship is three years." He added: "It isn't automatic you are going to get the skilled labour coming on stream in time to build the facilities." He said British firms should be made to invest in training as a condition of gaining contracts, although he stressed this was a personal view and not that of the MAC. The MAC will later this year publish a new, streamlined list of shortage occupations - the current one includes 26,000 jobs - as part of the government's new points-based migration system. The list will only include skilled jobs - those requiring the equivalent of NVQ Level Three or two A-levels - which fall into "tier two" of the new system. Where are the workers going to come from to build Poland's new stadia, as well as to build ours? The MAC has not been asked to specifically examine "tier three" or unskilled jobs, in relation to the 2012 Olympics, but Professor Metcalfe left the door open to the ban being relaxed in the future. "Presently that tier is suspended because it is held we can get all the labour we require from within the EU," professor Metcalfe. "Therefore if the MAC were asked to look at this, the large question I think would turn on, should the suspension of tier three be lifted?" Professor John Salt, of University College, London, said labour shortages in the UK could be caused by Poland's hosting of the 2012 European football championships - and the fact that it was "about to embark on a new programme of large stadium building". "Where are the workers going to come from to build Poland's new stadia, as well as to build ours?," he asked the committee. 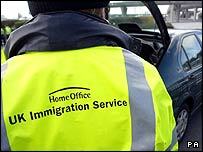 Professor Salt, who is one of the UK's leading experts on migration, also told the peers it was not possible to accurately estimate how many illegal immigrants there were in the UK. There were also no figures on how many people were currently in the UK with work permits, he added. And he called for a "step change" in the way population data is collected in the UK saying: We have pushed existing data as far as we can." On future migration trends, he said countries "just beyond" the EU, such as The Ukraine, which was currently "filling in shortages everywhere", were where the next migrants were likely to come from. Asked if government plans for identity cards would help curb illegal immigration, he said: "No, if they are capable of being forged - and that is probably likely to happen."